* Opening a company in Panama or Belize requires the services of our top-rated law team. Once De Puy & Associados completes the necessary administrative procedures, your company will be able to open corporate bank accounts, subscribe new contracts with clients and suppliers, register its business name and logos and assume duties as a corporate entity. * Investing in Panamanian real estate is a profitable enterprise. De Puy & Asociados counsels their clients on the required transactions for property acquisitions. * Among the most important legal mechanisms for generating business in Panama is the policy of open registry ships, which allows the owner of any vessel to register it under the Panamanian flag. * Panama also has a corporate law that permits optimal international transactions, protection to assets and investments, and allows the operation of any lawful business in or outside the country. Other areas that are integral to the country´s Corporate Law are limited liability companies, trusts, and private interest foundations. * Panama´s tax system is characterized by the principle of territoriality, Therefore, gains from foreign sources are exempt from taxes, regardless of the nationality of the taxpayer or the radius of their business operations. * The country also operates on the US dollar without a central bank to issue currency and keep a control on capital movements. It is also a stable democracy with one of the world´s fastest growing economies. * In 1948, Panama created the Colon Free Zone near the Atlantic entrance to the Panama Canal, to provide manufacturers with an international market for their goods. Today, Colon is the largest duty free zone in the Americas, and second largest in the world. You don’t have to be a giant multinational corporation to take advantage of the attractive tax advantages the Colon Free Zone offers. Contact De Puy & Asociados for further information. * In 1992, Panama enacted Law No. 25, establishing Export Processing Zones (EPZs) and granting special fiscal incentives for industrial, commercial, and service facilities engaged in export-oriented production. The main export industries allowed in the EPZs are manufacturing, assembly, processing, telecommunications and high technology parks. Write De Puy & Asociados for further inquiries. 5. 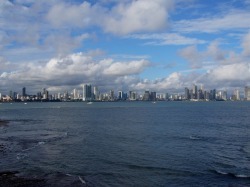 To further encourage tourism-related development, Panama has established several Special Tourism Zones. As an added incentive, investors also receive a 15-year exemption on income tax.